When both Gregorys Estate Agents and Lace and Grace Bridal Shop made the decision to occupy new units in the acclaimed gold cladded £35m retail hub known as ”Market Walk” in Keynsham, it was Capitol Signs, the Bristol Sign making Company, that was chosen to put the final sparkling touches to the shop’s imagery. 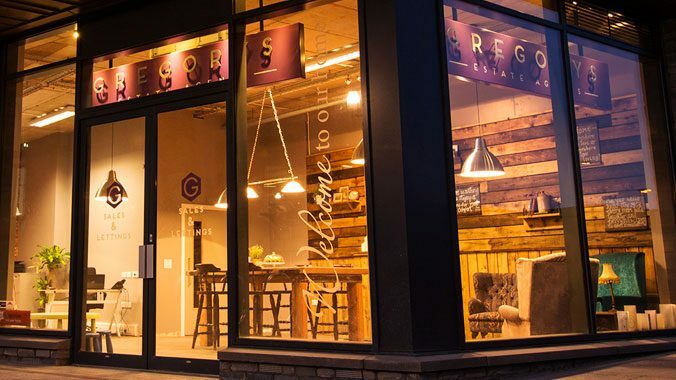 Gregorys has a unique ”home from home” feel about it for an Estate Agents, with its random wood panelling, comfy sofas, and table lamps. All this has been complemented with the design of illuminated brushed stainless steel lettering suspended from the ceilings, 3D corporate wall displays and inviting and welcoming window graphics. 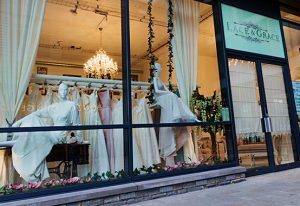 Lace and Grace Bridal is a beautiful, vintage inspired boutique. They showcase a diverse collection of carefully hand picked, exquisite gowns and accessories for the contemporary bride from talented, renowned British and international designers.